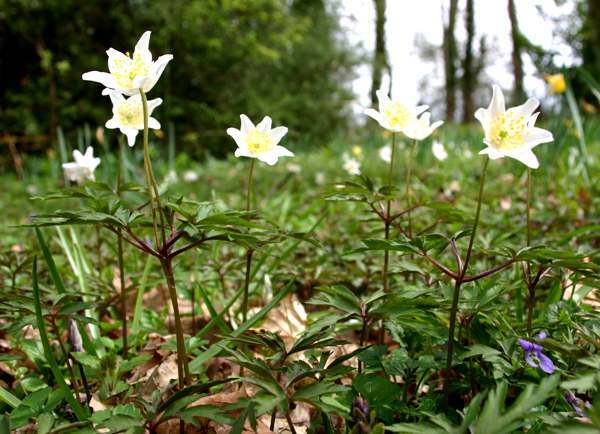 Wood Anemones are indicators of ancient woodlands, where they are among the most abundant and attractive of spring wildflowers. Anemone nemorosa is a perennial and grows to a height of about 15cm. The leaves, which die back once the plants have flowered and set seeds, are palmately lobed - very much like the leaves of the majority of other members of the Buttercup family, Ranunculaceae. The size of the flower heads is very variable; on the edge of the wood they can be twice the average size of 2cm diameter when fully open. Often opening pinkish-mauve colour and gradually turnbrilliant white, the flowers each have six or seven tepals (petals and sepals), but exceptionally they can have up to ten. These flowers,stand out particularly well in springtime, because the main leaves do not appear until after blooming is completed. 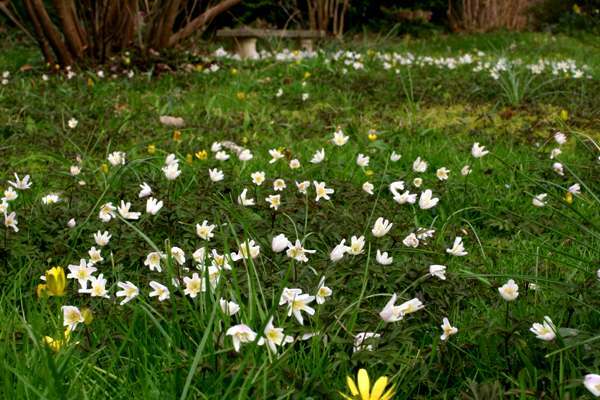 Wood anemones propagate mainly by means of creeping underground rhizomes. 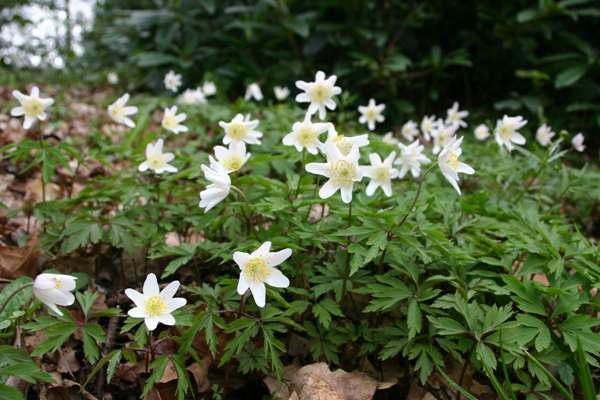 Common and widespread in Britain and Ireland, Wood Anemones are found also throughout most of mainland Europe except for the very dry and sandy southern parts of the Mediterranean region. This gregarious wildflower has also been introduced to many other regions of the world, including North America. These star-like wildflowers line rural hedgerows and carpet the floors of deciduous forests and woods. Wood Anemones are pollinated by a wide range of insects, but research in Germany has shown hoverflies to be particularly important pollinators of this species. This woodland wildflower was described scientifically by the great Swedish naturalist Carl Linnaeus, in the first edition of his Species Plantarum, published in 1753. 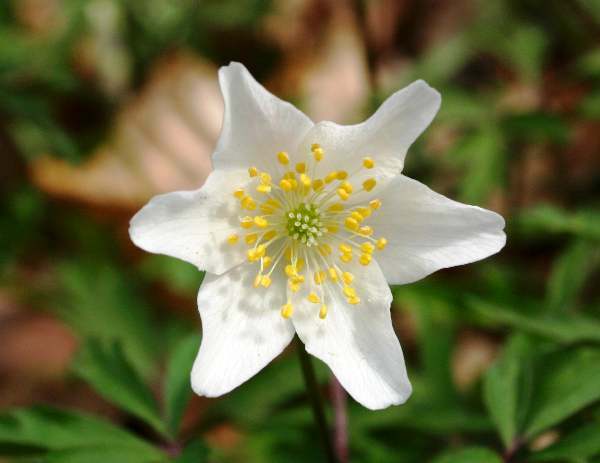 Linnaeus gave the Wood Anemone the binomial name Anemone nemorosa by which it is generally known to botanists today. 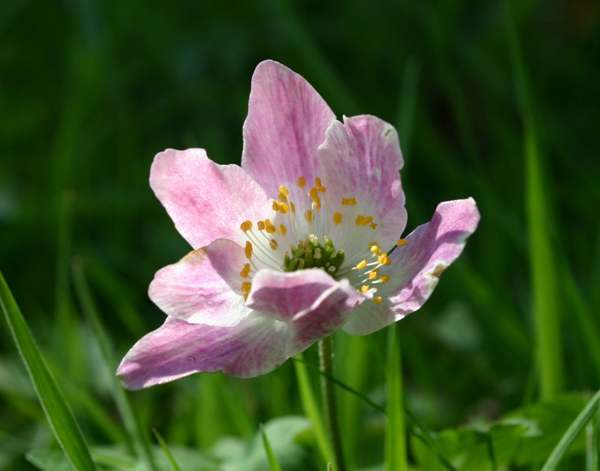 Anemone comes from Greek and literally means 'daughter of the wind', and one of the old common names for this species is Windflower. The specific epithet nemorosa is derived from the Latin nemus meaning ‘forest’ - a reference to the woodland habitat in which these flowers grow. On bright days Wood Anemones growing on a south-facing edge of a wood all turn their heads to follow the sun from east to west - as seen in the picture on the left. The plants shown on this page were seen and photographed in woodland habitats in Wales and in Sweden.